Midway through Advent each year, the Church celebrates two Marian feast days beginning with the Immaculate Conception and ending with the Feast of Our Lady of Guadalupe. These serve as great reminders that our Advent should imitate Our Lady’s. The Feast of Our Lady of Guadalupe marks the appearance of Our Lady to St. Juan Diego in Mexico. 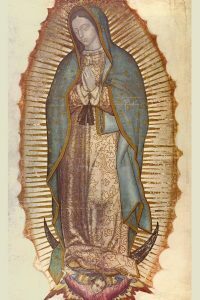 Her visit was a turning point in the evangelization of the New World, in part, because of the beautiful image of herself she gave to St. Juan Diego. The Woman is pregnant in the image, putting her motherhood prominently on display—sending a clear message to the people of Mexico that she is their Mother. Her message though was not just for the people of Mexico, but for all of us. She desires above all else to be known as our mother. On the day of the third apparition, St. Juan Diego’s uncle grew deathly ill. Rather than turn to Mary for help, he avoided traveling over Tepeyac Hill where he had encountered her and sought help from a doctor instead. “Listen, put it into your heart, my youngest son, that what frightened you, what afflicted you, is nothing; do not let it disturb your face, your heart; do not fear this sickness nor any other sickness, nor any sharp and hurtful thing. Am I not here, I who have the honor to be your Mother? Are you not in my shadow and under my protection? Am I not the source of your joy? Are you not in the hollow of my mantle, in the crossing of my arms? Do you need something more?” (emphasis added). This gentle rebuke could be directed to any one of us. Like St. Juan Diego, we are confronted with many fears and anxieties. But for those who realize that she has the honor of being our Mother and live in her shadow and protection, there is nothing to fear. If we are to draw the most fruit from Advent, then we should, like the Magi, expect to meet Our Lady before we meet Our Lord. When speaking of realizing any truths of the Faith, it is more than simply knowing them. We may intellectually assent to Mary’s Motherhood, but we must also make it real in our lives. It ought to be something that animates all of our actions. This need to keep Mary in our heads and our hearts is part of the inheritance Our Lord left us. Our Lord didn’t simply point out to our heads “behold your Mother,” but also commanded each of His disciples “take her into his home” (c.f. Jn 19:27). The first obstacle can, like St. Juan Diego’s, be one of the head. In recent memory, devotion to the Blessed Mother has declined within the Church as a whole because of a failure to adequately acclaim her as Mother. 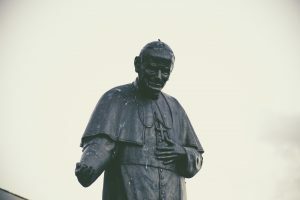 This has been especially the case as the Church has attempted to appear more “ecumenical” by emphasizing those things which we share in common with our separated brethren. But Mary is not just Mother of Catholics, but Mother of all Christians. To restore Mary to her proper place, we should return to our Christian roots. To the early Christians, Mary was primarily known as Mother. When St. Paul spoke of Christ as the New Adam, this was always predicated on the fact that there was also a New Eve. The promise after the Fall was for a Redeemer (Gn 3:15), the one identified as the seed of the woman that would bruise the serpent’s head. But that is not all. Looking at it more closely we see the promise is really for a new Adam and a new Eve (Mary). Both the “woman” and “her seed” are linked together in crushing the serpent. In God’s original plan of creation, He begins with Adam and Eve together. Eve, as her name implies, is “mother of all the living.” In the plan of re-creation, God again begins with a New Adam and a New Eve that was also to be the mother of all the living. It is John the Evangelist who most clearly points out this Adam/Eve and Christ/Mary connection by connecting his gospel with Genesis; creation with re-creation. He moves from “in the beginning” (day 1), to the “next day” when John pointed Jesus out and then the next day when the disciples meet Jesus. Then John skips ahead 3 days, saying “on the third day”. For those of us counting that makes day 6 and what do we find? A wedding, just like in the first creation account. In John’s account of the New Creation we see that there is a wedding in which the bride and groom are not mentioned but “the mother of Jesus” and Jesus are. 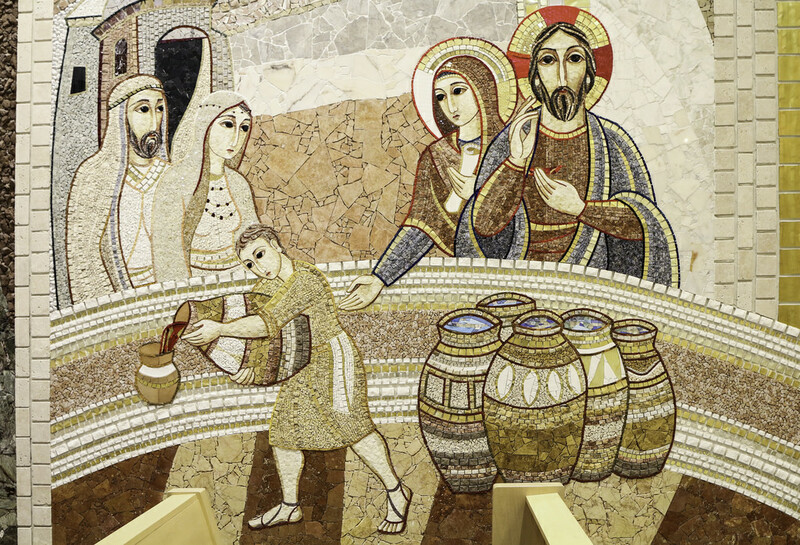 When asked to provide wine, Our Lord refers to His Mother as “Woman.” With the parallel to Genesis we realize that in calling her Woman, Jesus is calling her the New Eve. He is reminding her that once His mission as the New Adam begins with His first public miracle, her mission as the New Eve will begin as well. She reveals the purpose of her mission—telling everyone to “do whatever He tells you” (Jn. 2:5). It is no literary accident that the last pre-Resurrection “whatever He tells you” is the command to “Behold your mother” (Jn. 19:27). 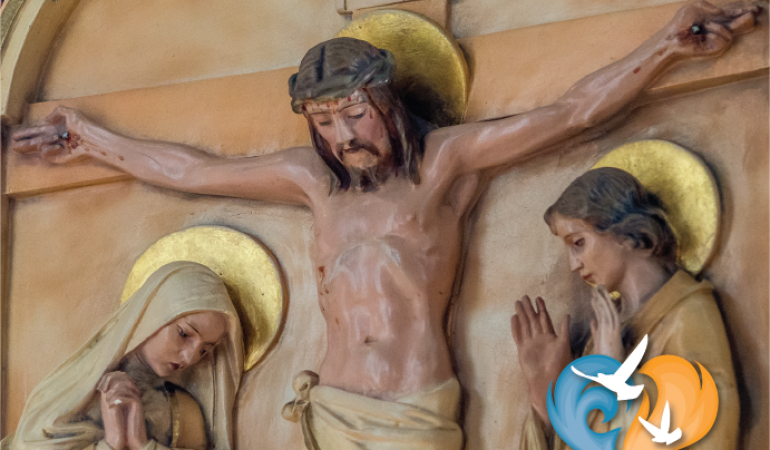 We know the divine commandment is not merely for John because Jesus once again invokes the name “Woman” to connect her to Eve, the mother of all the living. This New Eve would serve as the mother of all the living, that is those who are alive in Christ as Beloved Disciples. The New Eve, that is the Mother of all those living in Christ, is the first title that the early Church applied to Mary. It is also foundational for us in rendering to Mary the honor that God intended. The second obstacle is one of the heart. Our devotion to her can often take on a defensive character such that we are more interested in defending the doctrines about her than in having a true relationship with her. In being defensive, we often become offensive to her. We forget that Mary is a real, living person and like all living persons it is not enough to simply know about her, we must seek to know her by encountering her. There are any number of ways in which we might allow Our Lady into our homes, but this almost always begins with a devotion to her in the Rosary. In praying the Rosary, we are never praying it alone. Our Lady is always present to us and praying with us. As the words of the Hail Mary remind us, she is always with us at the two most important moments in our life—now and at the hour of death. It becomes a great moment of intimacy because, like all moments of prayer, we are vulnerable. We bear our hearts and our needs to her as she shares the secrets of her Immaculate Heart with us. It is also a moment in which her motherly generosity is on display. As St. John Paul II said, “Through the Rosary the faithful receive abundant grace, as though from the very hands of the Mother of the Redeemer” (Rosarium Virginis Mariae, 33). Despite literally thousands of miracles attributed to Our Lady of the Rosary, it is not something that can be proven, only experienced. No one who has put their trust in the power of the Rosary has ever been disappointed. Quoting St. John Paul II again, “Why not try it?” (RVM 42).